Log Drive circa 1909 The Martintown Grist Mill was built in 1846 by Alexander McMartin. It replaced the original wooden grist, saw and carding mills built between 1801 and 1803 by Alexander's father, Malcolm McMartin. In addition to building the mill which stands today, Alexander McMartin also served the community as Justice of the Peace, Sherriff, Member of the Legislature and Lieutenant Colonel in the militia. Through a succession of owners and millers, the Martintown Mill served the community as a custom mill. Local residents and farmers would bring their grain to the mill to be ground into flour. Typical orders were for a bushel at a time of wheat, corn, buckwheat, oats and malt. Milling industry on the Raisin River attracted settlers to the village as houses, a school, church, shops, taverns and a blacksmith were established. 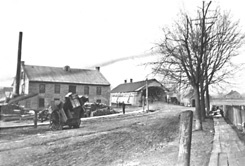 The village was originally called McMartin's Mills and later changed to Martintown. Annual log drives were an exciting sight in the village. 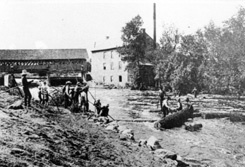 Logs collected in the mill pond at Martintown were released through the rapids when the mill dam was raised. This four-storey stone grist mill, is located on the south side of Dundas St. and the east bank of the Aux Raisin River. It was built in 1846 by Alexander McMartin replacing a wooden grist mill built by his father, Malcolm McMartin, in the early 1800's. Malcolm McMartin was a native of Perthshire, Scotland and a New York Loyalist. The McMartin family also had a Carding Mill and a Saw Mill, thus providing the surrounding area with much needed flour, feed for their animals, textiles, and lumber. The mills provided a great place to see your neighbours and catch up on the news of the day. I am sure if the old walls could talk many great stories would be told. With the mills other related businesses soon sprang up in McMartin's Mills, later known as Martintown. Making it the "Hub of Activity," as people travelled up and down the river. It has been recorded that in the early years McMartin's Mills was a more important town then Cornwall, with more businesses established. The need of a good water supply to run the turbine turbine for power meant the construction of a dam across the river. The early dam was made in three sections from large timbers. These sections were raised and lowered by hand with a chain and windless to control the water levels in the headpond. In 1861 severe spring floods washed out the bridge and dam. The local people gave William Sylvester and his brother a contract to replace the bridge and dam. He built a cement dam and a covered bridge of white pine with a shingle roof. The bridge lasted until 1936. In the early years the mills were run with water power. As fields became ditched and tiled the water soon ran off in the spring causing the water levels to drop drastically even in the headpond. Thus it was necessary to find other sources of power. Sylvester added a Steam Engine to supplement power in the dry seasons. Old photographs show a shed on the south side of the mill with a smoke stack where they had the steam engine. A miller by trade, Thomas Willing purchased the mill and the water rights - with a small portion of the water rights going to the Carding Mill on the opposite bank of the river - from the McMartin Family for $3,600 in 1870. Around 1881 he purchased a more efficient Leffel Water Wheel. In 1898, David Cresswell, purchased the grist mill for $5,540. He purchased new equipment, one being a roller to produce high quality flour, and did extensive repairs to the mill. He advertized that his mill could not be surpassed in Eastern Ontario for experienced workmen and modern equipment. After the death of his father, William Cresswell acquired the mill. He was not active in the mill’s operations so it suffered a period of decline. Ken Barton & Ken McDermid leased the mill for a few years before buying it. They added a 40 horsepower gas engine and brought the mill back into a successful operation. Later they used tractor power when water levels were low. It was placed outside the northeast end of the mill with the belts going in through the north door. In 1947, Barton and McDermid built the building on the west side of the river and moved their milling operation over there adding a mixer and more modern grinders. The new dam built around 1987 that is there now was constructed north of the bridge which local historians greatly disapproved of. Fishing on the river provided a good food source. Pike, pickerel, both black and red suckers came up the river to spawn in the rapids. Nets made from chicken wire were strung across the river at it's narrowest places. After the dam was built, the fish came to the dam and were not able to get past, so they were caught there. Even today in the spring you can see the fish spawning in the rocks beside the mill. It is quite a sight. Some local fishing enthusiasts, who lived above the dam, up toward St. Andrews and beyond, did not approve of damming the river so tried to remove the dam. They stood on the bridge, in the middle of the night, and accidentally dropped a bag of dynamite over the side and let it float down the river till it hit the dam blowing a large hole in it. However, the dam was later repaired so they decided it would be better to convince the owners to let them install a fish ladder. This was done with volunteer help in the summer when the water was low. Local farmers came with tractors and cement mixers and did their best but the fish did not seem to appreciate their efforts and their fish ladder didn't work much better than the hole in the dam. The game wardens were often keep quite busy trying to catch fish poachers who were spearing the fish at night with the aide of a light. Another feat that some people became quite proficient at was being a log roller during the log drives. There was an Indian who could ride a log over the dam without falling off. The stone grist mill was left vacant for many years and in 1971 Ian McMartin, a descendant of Alexander McMartin purchased the mill. Ian met with an untimely death before he was able to do something with the mill. After his death, his sister Marjorie McMartin gave the mill to the Raisin Region Conservation Authority, in the hopes they would be able to save it. They were located in the new mill built by Kenny Barton. In 1982 the Township of Charlottenburgh and the Ontario Heritage Foundation jointly funded a preliminary stabilization and the R.R.C.A. did some emergency wall shoring. During 1985 the Township and the R.R.C.A. decided the mill was not worth repairing and were going to tear it down. This being one of the last mills of its kind still standing in S.D.&G. and it being a major factor in the development of the agriculture sector of our area, many local people came forth to save the mill. The Friends of the Martintown Mill, later renamed the Martintown Mill Preservation Society Corp. was incorporated on June 27, 1986. Officers were; President - Bruce McCuaig, Vice-president - Sylvia Thomson, 2nd. Vice-president - Marland Murray, Secretary - Dr. Martin Bowman, Treasurer - Pearl Murray, Directors - Sylvia Thomson, Joan MacDonald, Dr. Wilfred Johnston, Marland Murray and Douglas Murray. Founding members were; Garth Campbell, Bruce & Marion McCuaig, Donald & Sylvia Thomson, Dr. Wilfred & Joan Johnston, Dr. Robert & Dorothy Moore, Dr. Martin Bowman, Jillian Horgan, Douglas & Mary Murray, Marland & Pearl Murray, Joan P. MacDonald and Marjorie McMartin - Honorary. The members pledged to raise funds to help finance the stabilization of the mill. The stabilization cost of $182,354.00 was divided with the Ontario Ministry of Citizen and Culture providing a Community Facilities Improvement Programme Grant for 53%, the Township of Charlottenburgh and the Raisin Region Conservation Authority providing 25% and the Martintown Mill Preservation Society Corp. raising the remaining 22%. We met our commitment of $39,085.00 plus another $1722.00 for landscaping, plus we had a bit of money left over. Keller Engineering Associates from Ottawa, was hired through the R.R.C.A. to do the Engineering Study and oversee the restoration of the mill. They hired Magus Restoration of Ottawa to do the restoration work. Due to the fact the mill was owned by the R.R.C.A. anything our committee wanted to do with the mill had to go through their Board of Directors also it meant we could not get a Charitable Statics. Thus, we had to work through the R.R.C.A. and Township in order to give receipts. Some of their directors were required to serve on our committee. After our commitment was fulfilled, many of our members thought our obligation was completed and wished to disband and resigned from the Preservation Society in June 1993. Five of our members, Donald Thomson, Joan McDonald, Joan Johnston, Marland and Pearl Murray, did not feel this appropriate, so kept the organization going, with Marland Murray as President, Donald Thomson as Vice-president, and Pearl Murray as Secretary-Treasurer. The mill has a Heritage Easement on it and in 1993 the mill received an Ontario Heritage Foundation Easement Plaque from The Ontario Heritage Foundation. The Unveiling and Dedication Ceremony was held at the mill on Oct. 9, 1993. Chairman was Marland Murray, Ontario Heritage Foundation Representative was Dorothy Duncan and Past Director Joan Johnston. Greetings were received from The Hon. John Cleary, M.P.P., Dave MacDonald, Reeve of Charlottenburgh Township, and Ron MacDonell, Chairman of the Raisin Region Conservation Authority. History of the mill was given by, Donald Thomson. The plaque was unveiled by a former owner and benefactor of the mill, Marjorie McMartin. The Dedication was given by Rev. Caroline Turner. A lunch and social time was held in the mill after. Pipers Don Blackadder, Adam Blackadder, Rory Buchan and Drummer Richard Irwin provided entertainment. This mill was built in 1846 to replace part of a milling complex developed by Malcolm McMartin early in the century. Like similar operations throughout the province, the McMartin mills provided essential local services in an era of poor transportation. They served area residents by sawing timber, carding wool, fulling cloth and grinding grain. The mills and their associated tavern and store attracted tradesmen and residents, creating the village of Martintown. Malcolm McMartin’s son Alexander, builder of this mill, became an influential local businessman, militia leader and politician. His grist mill survived in a market increasingly dominated by larger competitors until it finally ceased operations in 1951. In 1995, with our changing times, the R.R.C.A. faced heavy cutbacks and were no longer able to sustain the responsibilities of the mill. Some of their members were again talking of tearing it down. The M.M.P.S.C. felt this was not acceptable. With new members joining and some former ones returning, we purchased the mill and it’s water rights from the R.R.C.A. in 1997. New members were; Ernest Higginson, Brian Shackleton, Jean Butler, Bob Evans, Rita O’Reilly, Charles & Grace Bruns, Linda Gumbs, Shirley Leach, Lyall Manson, Rene Legault and Jimmy Murray. Before purchasing the mill in 1997, we hired Keller Engineering Assoc. who did the previous restoration on the mill, to check it for further deterioration. They were very pleased at its condition. There was some cracking on the south wall that needed attention, some holes where animals had found their way in needed plugging and some eavestrough work needed done. Our Leffel Water Wheel, which we have been told is very rare as it is horizontal instead of vertical, needed more sealants put on it to keep it from rusting. In 1998 Keller Engineering hired Garrett Restoration to restore the south wall and turbine. Also in 1998, with the acquisition of the mill, minor changes had to be made in our Letters Patent concerning Associate Directors. Now that we were owners of the mill we were able to receive our Charitable Statics Number. A new slate of officers was elected in Feb. President - Ernie Higginson, Vice- president Donald Thomson, Secretary - Linda Gumbs, Treasurer - Pearl Murray. Directors were; Marland Murray, Donald Thomson, Ernie Higginson, and Jean Butler. During the year we spent $24,145.77 for an engineering study and repairs too southeast wall and turbine. During 1999 and 2000 we applied for and received a Canada Millennium Partnership Grant $3,186.00 and a Heritage Challenge Fund Community Program Grant $23,801.80 to install electricity, have an engineering study for specks to make the mill meet safety standards, replace and repair broken carrying beams, install a new floor and a stairway going down to the turbine, and repair some windows. Thus, fund raising projects were started to raise matching funds, raising around $30,000.00. Glengarry Electric installed the electricity, Tony Van Reil Construction did repairs to the roof, lumber was purchased from Robertson’s Sawmill and White Pine Lumber and D.& J. Laferriere Construction repaired and replaced support beams and the 1st floor, built steps and railing going down to the basement, also put in another cement, support post in the basement. Keller Engineering was hired to inspect these repairs. Roger Charron and Donald Thomson installed Lexan over the windows. By 2004 we have the electricity installed, a two-inch tongue and groove red pine floor installed, support beams replaced or repaired, plus the addition of one more cement pillar as recommended by the engineering study, a safety railings and mesh around the opening for viewing the turbine and a stairway installed down to the turbine. We are now considering repairs to the windows. In 2006 we received a $30,000.00 grant from the Ontario Trillium Fund. With this funding we installed 14 replica windows. New World Timberframes made two and River View Creations made and installed twelve. Glengarry Electric installed light fixtures and wiring to show off displays. D. J. Laperriere Construction repaired the 2nd floor and moved some of our heavy artifacts. Dan Long painted the roof and Clear Acrylic and D. Johnston’s Antiques made display cases. Burt McLennan did railings for step to the 2nd. floor and helped move artifacts. We have set up displays of our unique artifacts to share with the public, and have the mill open several times during the summer for the public to view. We are also open by appointment for tours. Thus, allowing our children and grandchildren to learn the importance of mills in the development of this country. Therefore, fund raising is an on going process and we appreciate any help anyone has to offer. Fund raising events over the years have included canvassing local business , residents and former residents for donations. We have held raffles, had dinners, held auctions, had a Wine & Cheese, done catering and have sales of memorabilia. In 2009 we have received a 50/50 grant of $4,800.00 from the Township of South Glengarry to install 3 reproduction windows on the north end of the mill and to set up historical displays. This we hope to accomplish in 2010. 2015 Board members of the Martintown Mill Preservation Society are: President - John Smith, Eileen Williams, Donald Thomson, Marie Higginson, Jean Butler, Marilyn Blackwood, Barb Bracken, Doug Murray and Ernie Higginson.